Exotic Car Rental Golden Beach (305) 925-0456 Rent Today! A Lamborghini has been the symbol of power, luxury, and wealth since the very beginning when Lamborghini cars became available to the market, or at least to the rich. But with so many kinds of sports car manufactured by Lamborghini; do you really know which one you want to own or drive? I hope you have The Lamborghini Aventador in your list because it is one of fastest and most handsome vehicle you will ever see. It is quite expensive which make it more harder to own where only 2000 cars are made and sold since it came out in the market in 2011. Imagine driving a car where only 2000 people own out of the estimated 7 billion people in the entire world! How lucky are you? But even an ordinary middle class person can now drive an Aventador through the many specialty car rentals that are currently in business in the cities around America especially in the neighbourhood of Miami Beach. All because we, Exotic Car Rental Golden Beach, is here. 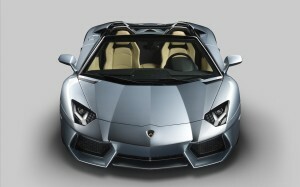 The new Lamborghini Aventador LP 700-4 Roadster immediately identified by its unique profile, especially in the upper part of the cabin, with lines extending from the removable roof geometrically until it reached the engine cover. The design of the convertible was the result of a careful study to combine the best of high performance, sleek styling and ease of use, thanks to a two-piece roof made of carbon fibre. These technologies ensured the highest level of aesthetics and performance. The rear cab pillar was redesigned to give the body full support when the roof is removed, making more room for an automatic system protection for passengers and enough inlet ventilation air to the engine. The power of the new Aventador LP700-4 Roadster comes from a mid-engine 6.5-liter V12 that produces 700 horsepower, mated to an automatic transmission ISR seven changes, which accelerates from 0 to 60 mph in just 2.8 seconds and reaches speed of 218 mph (350 km / h), which leaves virtually no competition in the segment. Its high level performance is not against the fuel efficiency of gasoline, since the new Aventador LP700-4 Roadster includes cylinder deactivation technology, when the engine is operating at partial capacity and instant system Stop & Start that shuts off the engine as soon as the vehicle stops and when the driver lifts off the throttle, a first in the segment of supercars. At first glance, the highlights in the engine cover is different in the convertible compared to the coupe where its “backbone” are a two parts of the central hexagonal windows connected to the sides, as if it were a plate armour used to cool the engine , filter rainwater and of course, admire the beauty of the V12 engine. Not a bad car to drive around Biscayne Park. Both the driver and the passenger of the Aventador Roadster can choose the level of intensity at which you want to enjoy the driving experience, thanks to a rear windscreen that not only controls the flow of air, but also regulates the sound from the engine. The air deflector, which is installed on the windshield and can be stored in the front luggage compartment when not in use, you can enjoy a cabin with a calm environment even at high speeds. The Aventador Roadster is also equipped with windows in the doors with flat frames that are long and narrow that links to the roof surface in perfect shape and you can rent one from exotic car rental Miami for the day. The body of the new Lamborghini Aventador LP 700-4 Roadster is painted in two tones, with the windshield pillars, the two sections of the roof and rear window flaps gloss black to give it a visual effect of a totally open self. The range of colours available for the Roadster has been supplemented with pale metallic blue, “Azure Thetis”, which varies according to the angle you are looking at. Lamborghini also redesign the booth to differentiate the coupe with the use Nefertem Sabbia leather, glitter light upholstery seats in craft workshops in Sant’Agata Bolognese, which perfectly complements the exterior. The power of a Lamborghini could make a homeless man look like a million dollar. So if you are hoping to get a chance and take a Lamborghini Aventador out for ride, give us a call or come visit us in our main site. 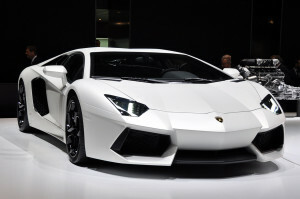 See the other luxury cars we have and run your fingers on an Aventador.